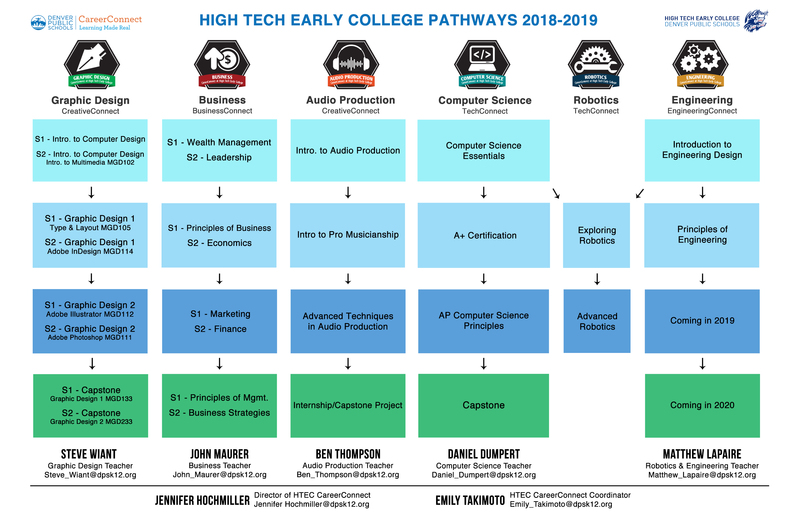 High Tech Early College offers six exciting pathways to postsecondary readiness for High Tech scholars. We offer rigorous courses in the areas of Audio Production, Business, Computer Science, Engineering, Graphic Design, and Robotics. High Tech scholars will also gain valuable real life experience where they can apply their learning through our internship and job shadow opportunities within each pathway. BusinessConnect prepares graduates to become tomorrow’s business leaders. Courses may include introduction to business, web page design, finance, marketing and entrepreneurship. Students may have the opportunity to receive college credit and industry recognized certifications such as the Microsoft Office Specialist (MOS). For more information about, visit Denver Public Schools BusinessConnect Program Page. As a leader in the creative industries, Colorado is the perfect place to connect DPS students with careers in the arts. Courses include everything from graphic design to performing arts. Students may have the opportunity to receive college credit and industry-recognized certifications such as the Adobe Creative Suite while in high school. For more information about, visit Denver Public Schools CreativeConnect Program Page. EngineeringConnect leverages nationally-recognized Project Lead the Way (PLTW) curriculum to provide rigorous, project-based classes designed to mold future problem solvers. Students from this program will have numerous opportunities for college credit while still in high school and may even have the chance to receive preferential admissions to various engineering programs at Colorado universities.For more information about, visit Denver Public Schools EngineeringConnect Program Page. Prepares students for a wide variety of careers including but not limited to software engineers, robotics technicians, IT support, and web designers. Students may have the chance to receive college credit and industry certifications such as A+ certification. For more information about, visit Denver Public Schools TechConnect Program Page. ACEConnect is both a CareerConnect pathway and complementary program providing additional or tailored services to prepare students identified as special populations in Career & Technical Education to be successful in career and life by ensuring that they are workforce-ready. Students may choose to enter any industry, and ACEConnect helps them to build the work habits, as well as the collaboration and technical skills that align with their chosen career and industry focus. For more information about, visit Denver Public Schools AceConnect Program Page.